Date timers allow you to schedule an action to run at a specific date and time or within a date/time range, when a goal or landing page goal is achieved by a contact. Note, the exception to this is date timers added off Trigger goals. Any actions scheduled off your date timer will be performed on any contact in your campaign audience. Click on the action button (three vertical dots) to the right of any MOBIT goal or landing page goal and select Configure Timer. 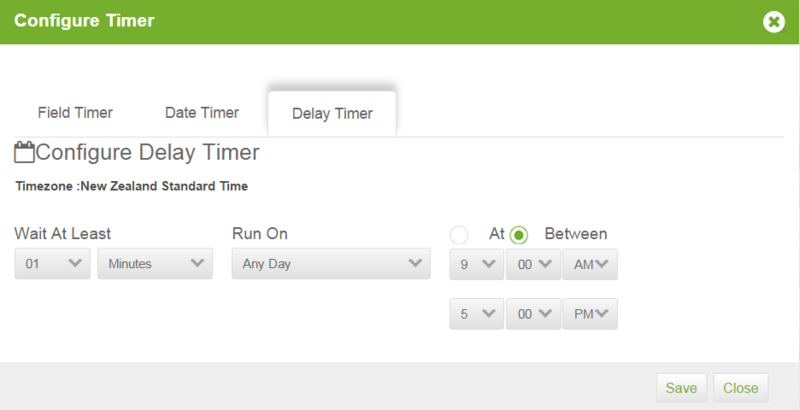 Select Date Timer and set whether you would like your timer to run On a specific date or Between a date range. Lastly, choose whether you would whether you would like your timer to run At a specific time or Between a time range. Click Save. Be sure to add an action(s) off your date timer. Your date timer alone has no value. Delay timers allow you to delay when an action will run after a contact achieves a goal. Click on the action button (three vertical dots) to the right of any MOBIT goal and select 'Configure Timer'. Wait at least: Wait at least settings configure the minimum required delay for any action(s) nested below your timer. The timer will run an action on the same day if you are using minutes or hours, as long as the acceptable window of time has not passed for that day. If it has, then the action will run on the next acceptable day and time. Run on: The run settings allow you to choose acceptable days, weeks, and / or months. The wait settings are taken into account first, then the system looks at the run settings to identify the first acceptable day or date. For example: weekday limits the acceptable days to Monday, Tuesday, Wednesday, Thursday, or Friday. If the wait setting alone would schedule a piece to go out on Saturday, the run setting will make sure the piece does not go out until the following Monday. At or Between: The At / Between setting allows you to define the acceptable time, or window of time, for the action to run. Be sure to add an action(s) off your delay timer. Your delay timer alone has no value. Any actions must be be added off your timer as described in step 3 of adding Date and Delay timer above. The below screenshot is an example of a wrong timer set up. Tag applied goals are not retrospective, and only contacts that are tagged from the point the tag applied goal is set up will be actioned. If your date timer is set up after a tag is applied to a contact, your contact will not be entered into your date timer sequence. If your date time is able to run outside of the time SMS's are legally are aloud to be sent in a contacts country, the message will go to your SMS manager, where you can decide if you would like to manually resend the message. You can also override country send times from your SMS settings.